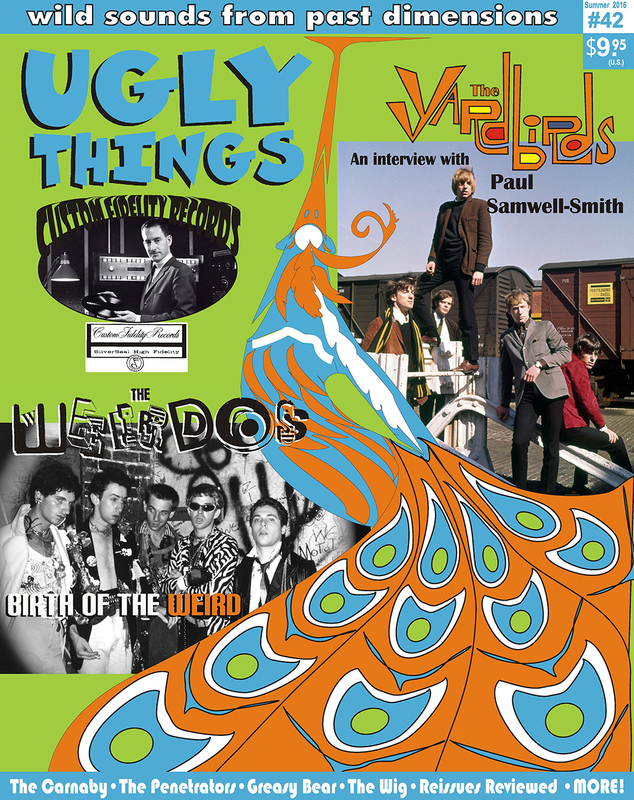 The Yardbirds, one of the most innovative groups of the ‘60s, are re-examined via a fascinating interview with Paul Samwell-Smith, the band’s bass player, musical arranger, and one of their key songwriters. The Weirdos were at the epicenter of the Los Angeles punk scene in the late 1970s, but their story has never been covered before with any depth or detail. We rectify that this issue with an epic feature story loaded with wild and weird photos. Also in the spotlight are London ‘60s mods The Carnaby and The Game, Syracuse budget rock heroes The Penetrators, Texas garage-punks The Wig, Berkeley power pop icon J.D. Buhl, late ‘60s Manchester long-hairs Greasy Bear, and frilly-shirted pop-psych purveyors Fortes Mentum. Also, the story of Custom Fidelity Records, a riveting journey behind the scenes of the vanity record pressing industry in its mid-century heyday. Not to forget the latest installment in Cyril Jordan’s ongoing Flamin’ Groovies saga, and our extensive review sections, the ultimate consumers’ guide to all the latest vinyl and CD reissues and rock‘n’roll-related books.